Click here to read some of our Periodontist Success Stories. 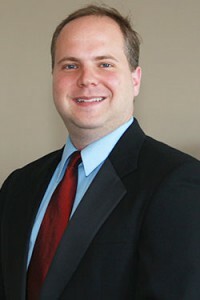 For the last several years Dr. Conkle has been focusing on implant dentistry. Orange County is a very competitive area for marketing dentistry. The online ads we run to the website we created for Saddleback require continuous intense management to get them to perform optimally and to compete successfully against the other dental implant advertisers. After constant testing of the ads, the geographic areas to advertise in, the position of the ads on the page and other factors, we found the best-performing formula for Saddleback to make the best use of its budget and maintain its competitive edge. “I have a heavy emphasis on dental implants in my practice. We do the All-on-4 procedure and some other routine dental implant procedures. One of the reasons I hired Gilleard was I wanted to grow that part of my practice. “I’ve been using Gilleard Marketing for about 4 years now. They are an amazing company to work with. They take an honest look at what is your business, where is it located, who are the people that are going to come to you and why. They look at how you can advertise what you’re able to offer them in a way that gets attention, but also lets people know that you have real value and skill to offer. “It was incredible what they did. They sat down and looked at all the competition in our area, and looked at demographic information on patients and people that live around us. They collected an enormous amount of data to try to understand what our office is, what our identity is and how we can best advertise and offer ourselves to the patients in our area. That process was exhaustive. I’ve never seen a company do something like that. “After that data was collected they then came up with a comprehensive approach to put our best foot forward. How can we have an online presence; how can we have a print campaign; how are we going to have an internet campaign and a website presence that is really going to all tie together and create a constant and consistent flow of patients for us each month. That’s exactly what they did. It’s been phenomenal to watch. The numbers range anywhere from 25–30 new patient interactions just off of the website and internet marketing alone. That’s not even considering print media. And those are quality patients that come into the office and they end up doing procedures that really help the practice grow. “The return on investment has been incredible. It’s been around 7–8 times the initial investment to start the campaign. They track every dollar you spend. They know exactly how many people are clicking on the Google AdWords ads, they know how many people call your office and where they came from. They even record the phone calls and listen to your staff and help you understand where along this process you can improve, from the patient finding out who you are to scheduling an appointment. They know what’s causing the person to actually come in and perform treatment with you. I think that alone—being able to track your dollars and understand how your spending is coming back to you and helping the bottom line of your business—is worth every dollar. 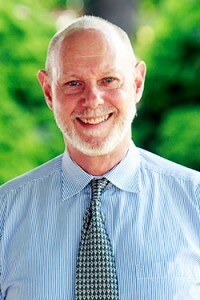 Joe is Managing Partner of four general practices in Virginia and North Carolina. 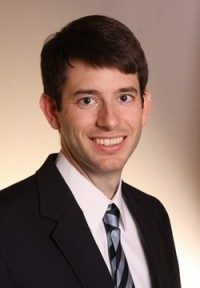 Joe is a practice management expert with an excellent record of success as both a consultant and a partner/principle in multiple practices. We created a custom magazine for his Potomac Falls Virginia office, co-owned with Nadar Hawa, DMD. The office was relatively new and needed marketing that would stand out and immediately draw high-production cases. “Gilleard Marketing created a custom magazine for our North Virginia practice around 18 months ago. We have mailed out thousands of the magazines each month. The results have been spectacular. “The magazine has brought us 20-25 additional new patients each month. But far more important than this, the production and income increase has been amazing. We have sold and delivered dozens and dozens of implant and esthetic cases, valued from $30,000-$50,000, and dozens more cases from $10,000-$20,000. “We have sold and delivered hundred of implants and implant-supported prosthetics as a result of this magazine. 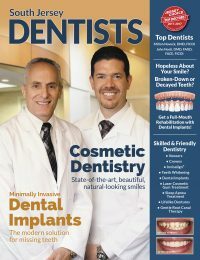 This magazine attracts large cases, and attracts people who need and want high-end dentistry. We are amazed at the quality of people this magazine attracts. “The return on investment has been enormous. If you are a good clinician who delivers high-end dentistry, then the Gilleard magazine is for you. We are in an extremely competitive and saturated market, and the magazine sets us apart from all other practices in the area. In 2011 McCalla Dental had just completed constructing a beautiful 10-operatory facility outside of Birmingham and Dr. Poczatek was looking for an aggressive Internet marketing approach. He and his partners had developed two previous websites but were not satisfied until they began to work with Gilleard Dental Marketing. In their first year with Gilleard their revenue jumped over $100,000 per month. In 2012 we created a custom magazine for them, which helped take their practice to another level. This magazine has been going out for several years now and stably brings them 25 to 35 quality new patient inquiries each month. “No other marketing has given us near the same ROI. Dr. Gray’s testimonial was sent to us after we had worked with McCalla Dental for a little over a year. Six years later we continue to provide their Internet marketing and direct mail marketing with the custom magazine and have also created an office brochure and mailing brochures for specific procedures. McCalla continues to grow, adding another partner and associates, and expanding on their service capabilities. As they increased their capabilities, including adding full-service All-on-4® treatment as well as all other implant-supported prostheses, we have kept their website, Internet marketing and custom magazine up-to-date, including new photo shoots as needed. McCalla is now constructing a second facility on their property. 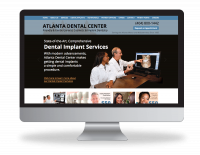 Atlanta Dental Center is one of the top dental practices in Atlanta, now grossing over $5 million annually. 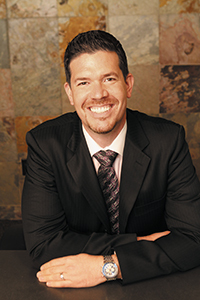 Our relationship with Atlanta Dental Center began in 2007 with the then owner, Dr. Joel Benk. At that time we did a market research project to gain insight into how to best market their services. We revamped their website and took over a direct mail magazine they were making and turned it into an effective marketing piece. This magazine took them over $1 million and things just grew from there. The backbone of their growth was our Internet marketing and custom magazine program along with good management practices. Over the years they added associates and increased their service capability. In 2011 we made an implant website and an implant magazine separate to the main website and magazine to highlight their high-production expertise. 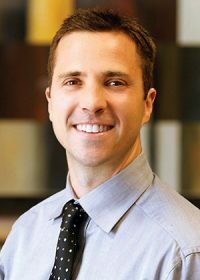 In 2014 Dr. Benk’s son, Josh Benk, took over managing the practice, continuing to grow it and its service capacity. 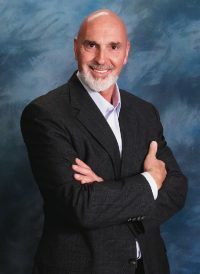 He chose to continue with the practice magazine and Internet marketing program, as well as the implant specific marketing and magazine programs. Their partnership with Gilleard Marketing it is very successful for them. “We have been using the Gilleard Dental Marketing program for about a decade. I do all aspects of their program. “Gilleard Dental Marketing is not your normal marketing company. These guys have done major research into the prospective patient pools and have isolated an exact understanding of what patients are looking for. I’ve seen some of their research, and is resembles clinical research from a lab. John Nosti, DMD is well-known in the dental world as an instructor and a Dental Town contributor. He and his partner, Milton Noveck, DMD, own two practices in South New Jersey. Dr. Nosti and Dr. Noveck partner with local implant surgeons to provide top-notch implant placement, restoration and full-mouth reconstruction. We created Drs. Nosti and Noveck a custom website followed by a custom magazine that featured their high-end services. In the testimonial below, Dr. Nosti talks about his success with the custom magazine. 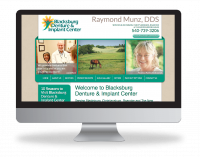 Dr. Raymond Munz owns a denture and implant practice in Blacksburg, a rural town in Virginia. Over the years he has worked with us, he has gone from stabilizing dentures with mini implants to doing full-mouth reconstruction procedures using implant-supported zirconia teeth. 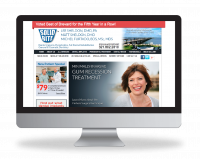 Dr. Munz does both our custom magazine program and pay-per-click with the custom website we made for him. Lee Sheldon, DMD is a periodontist practicing in Melbourne Florida. 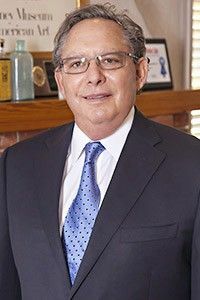 He also is the founder of the American Association of Independent Periodontists (AAIP), an organization dedicated to helping periodontists reach the general public with the message of how much they can help them with their complex dental needs. 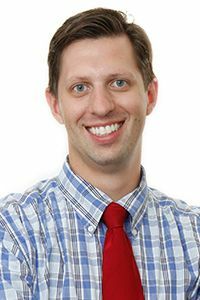 A few years ago Dr. Sheldon switched his marketing to Gilleard to help him successfully transition to a direct-to-consumer practice as well as a referral practice. We created a custom website prominently featuring implants and full-teeth replacement that immediately did well, and to double up on Dr. Sheldon’s new patients, we created a custom magazine that he has been mailing out regularly for several years. We have been running successful pay-per-click campaigns for him since 2012. Earlier this year his dental implant campaign’s performance dipped and we investigated. We discovered heavy cable television advertising and aggressive online advertising for dental implants from a local practice and from a nationwide chain. We created new online ads that combated his competition’s ads and reverted his inquiries back to their previous level. the source for treatment planning of complex dental cases. And that’s what Gilleard Dental Marketing has done, brought patients to our office that need complex care. “Periodontists, let’s remember who we are.We are diagnosticians first. We develop predictable treatment plans and work with restorative dentists as well as other specialists to produce long-lasting smiles and function. If you have the mindset that you want to see more patients who need and want the services that we provide, Gilleard can and will provide those patients to you. 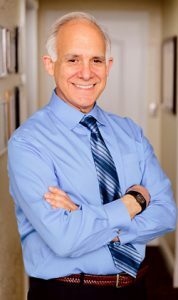 Stephen J. Feldman, DDS has been practicing periodontics since 1974 when he opened his practice in Venice, located on Florida’s Gulf Coast. He provides a valuable service to the area’s retirement and snowbird community. However, like most dentists in the area, especially periodontists, he suffered from seasonal swings. Thanks to the custom magazine we created for him, he now has work all year-round with no off-seasons. “I am writing this testimonial to relay to future clients of Gilleard Dental Marketing how pleased and thankful we are to have been referred to this company. They understand the dental market and how best to reach future patients. They created our website and also a 16-page magazine all about our practice. They are both extremely professionally done and very visually appealing. “Gilleard Dental Marketing is the best! All their employees are very professional and provide many different services, from the creative directors, distribution personnel, Internet marketing team and much more. I know this relationship with Gilleard will continue and we will continue to reap the rewards of being their client! “The magazine they created, published and distributed for our practice has been beyond what we expected. The magazines work all year round and there are no off-seasons, even in areas with seasonal fluctuations! We are so busy this off season. The summer and especially August has traditionally been slow but not this year. We are extremely busy and most new patients come from the magazine. Most of the other offices in our area are all slow, but not us! We are as busy as in season or more.